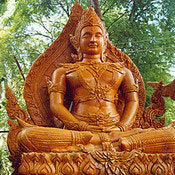 The Candle Festival is held each July in the North Eastern Province of Ubon Ratchathani to celebrate the beginning of Buddhist Lent or Khao Phansa. 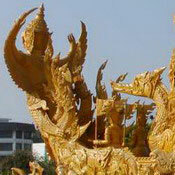 Giant candles with elaborately carved scenes of Hindu and Buddhist mythology are paraded on floats with dancers in traditional dress. For the three months of the rainy season from July to October, monks are required to dwell in the same temple and traditionally, big candles were given in the hope that they would provide light for the monks throughout the period of Khao Phansa. On the day before Buddhist Lent begins, Asanha Bucha Day, the candles are taken to Tung Sri Muang, a park in the middle of the city, where they are decorated and then exhibited in the evening. 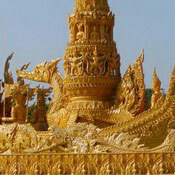 On the same evening, there are small processions with lighted candles at several temples. 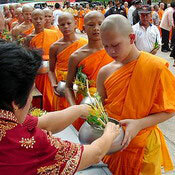 The main procession takes place early the following morning which, in Thai, is called Wan Khao Phansa. 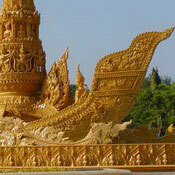 This festival is one of the best in the Thai calendar and will provide great memories for you of your time in Thailand.